I recently participated in an interesting blind tasting at Three Sticks Winery, in Sonoma. 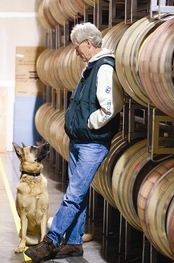 The winery was founded in 2002 by Bill Price, who also owns Sonoma’s Durell Vineyards -- famous for producing fruit that goes into high-scoring wines made by more than 20 wineries. This same pedigreed vineyard is the basis of the Three Sticks wines. Because the winery’s “home” vineyard is so special, Three Sticks wines are all about the fruit: namely, Pinot and Chardonnay. Winemaker Don Van Staaveren has been making wine from Durrell Vineyards grapes for more than 20 years -- he was winemaker at Chateau St. Jean and Artesa before joining Three Sticks -- so he knows the vineyard like an old friend. The winery was designed with Burgundian-style wines in mind, but it recently added a Cabernet Sauvignon to its lineup. This brings us to the reason for the recent Three Sticks trade tasting: To compare the winery’s Cabernet to top Cabs from both Napa and Sonoma counties. Eleven tasters -- including Price, Van Staaveren and a combination of wine writers, winemakers and sommeliers -- gathered to taste seven Napa and Sonoma Cabernets from the 2005 vintage and six from the 2006 vintage. For each flight we tasted through the wines blind, made notes, and ranked them according to our preferences. When everyone was finished, we took turns sharing our rankings. Only then were the wines unmasked. Along with Three Sticks, the following producers’ wines were included in the tasting: Shafer Vineyards (Napa), Buccella (Napa), Paul Hobbs Winery (Sonoma), Araujo Estate Wines (Napa), Kamen Estate Wines (Sonoma), Pride (Napa/Sonoma) and Lewis Cellars (Napa). Retail prices ranged from $65 to $89 per bottle. You’ve got to admire a vintner who has the confidence to pit his wines against the competition in front of media and trade members. On one hand, the influential tasters might adore the host’s wines, resulting in rave reviews and high-profile placements in restaurants and retail stores. Or, it could go the other way: They might hate the host’s wines. But smart vintners are willing to take the chance, because either way, there’s something to be learned from honest feedback. So how did it go for Three Sticks? In the 2005 flight, I ranked it as my No. 1 wine. (Guess who just made the Three Sticks holiday card list!) I found it to be just my style of Cab: red fruit, good acidity, subtle oak, smooth and balanced. However, I was the only taster in the group to place it at the top of the heap. A couple people ranked it as their least-favorite wine in the flight, and even the Three Sticks winemaker ranked other wines above his own (to his credit, he took it in stride). The most interesting and fun part of the experiment was in comparing notes with the other participants. Although my rankings and comments were similar to those of certain tasters in the group, there were no exact matches. One person would describe a particular wine as being ripe and opulent, while another would criticize the same wine for its sweetness and prominent oak. And yet, we all had the same wines in front of us. To me, this illustrates an important point: That there is no universally “correct” evaluation of a wine, even among professional wine buyers, winemakers and critics. This is why you’ll sometimes see the same wine receive a 92 score in one publication, and an 87 in another. On this very website you’ll find examples of differing opinions among critics -- and that’s just fine. The trick is in understanding what you like, and identifying the tasters who share your palate. Whether you’re a wine professional or a person who just likes to drink wine, a blind tasting is a great way to challenge your perceptions and get a better understanding of your own wine tastes. While you might consider yourself a die-hard fan of a certain region or producer’s wines, you might actually prefer different wines once the labels are obscured. Discovering and sharing these things is all part of the fun.